This little CD-R is a Christmas card of sorts. This release also exemplifies one of the effects of low cost home computer based CD-ROM publishing. It's all so democratic. What's missing is the first level of filtering that occurs when you have to either pay for pressing yourself, or get a label interested. While the artist in me thinks the direct route is the best, the listener in me sometimes wonders. This is the fourth or fifth release like this I've gotten this year. It's the sort of thing that is best left in the realm of a family communication. Phil Vanderyken sent me this because there is one instro on this 4 song CD-R. It's "Jingle Bells" with some variations. The rest is definitely home new holiday fare. Honest, but it should remain private holiday gift between family. 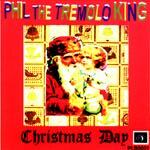 Phil has been performing as Phil the Tremolo King around NYC doing "surf/lounge." He is also guitarist with Piker Ryan's Folly, a punk-lounge band. So, is this a glimpse at the future of New York indie sound? Verging on neighborhood Ventures, this has a subdued guitar with some slight whammy, playing somewhere between the Chuck Berry sound and pre-surf guitar rock, but in a very calm fashion. The guitar is supported by a drum machine and an odd little keyboard sequence. It's unimpressive, but singularly a work of honest love. The guitar is mixed too low, being overshadowed by the keys.